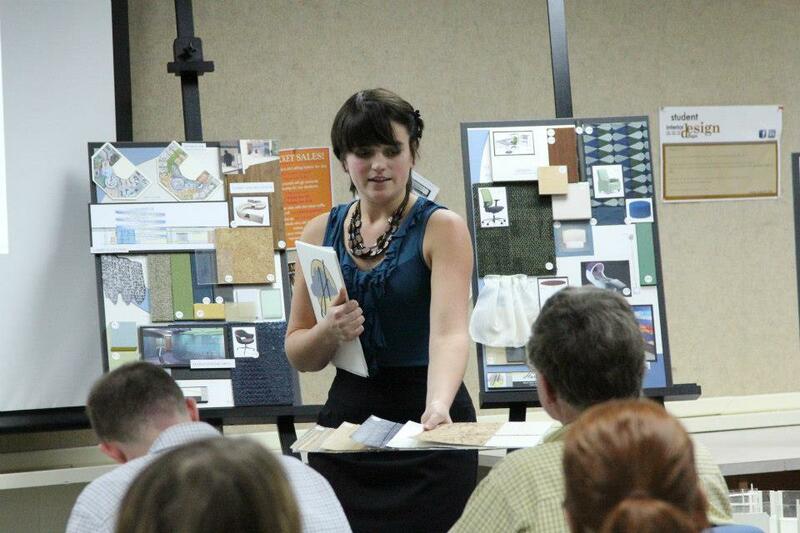 In the fall semester of 2012 I completed by final studio project in the senior level design class IA 411. 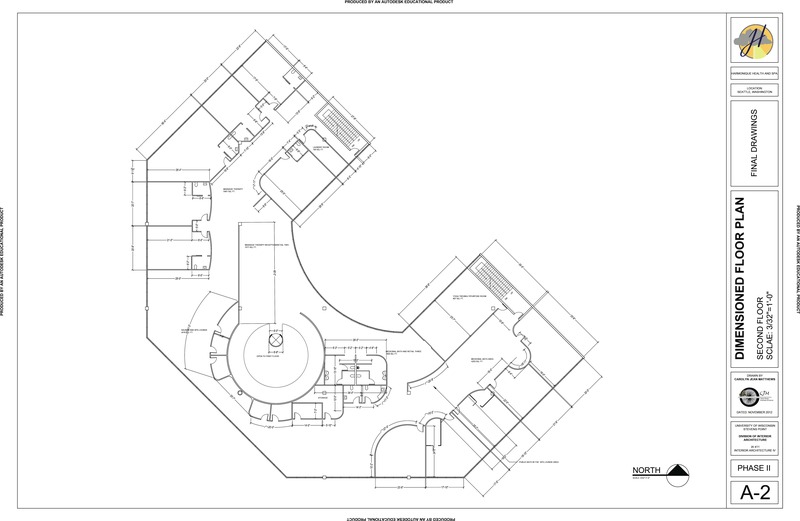 Taught By Dr. Nisha Fernando this course was project based and followed a series of steps to complete an integrated design for a multiuse Spa facility located in Seattle, Washington. In this post I will show and explain the different parts of each of the three required phases, explaining the design process and showcasing my final design. 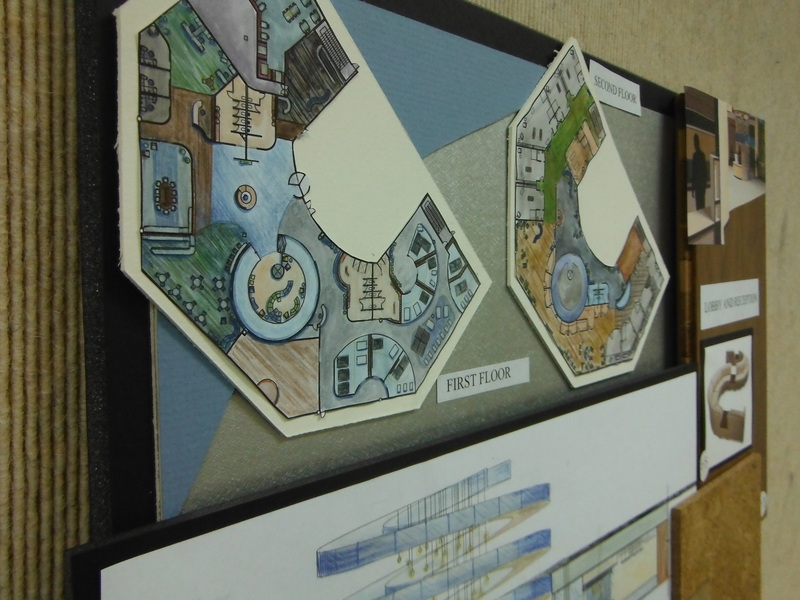 Detail of the rendered floor plans as seen on the final presentation boards. Harmonique is a multiuse health and spa facility tailored specifically to those with physical health concerns as well as t hose with visual and or hearing impairment. 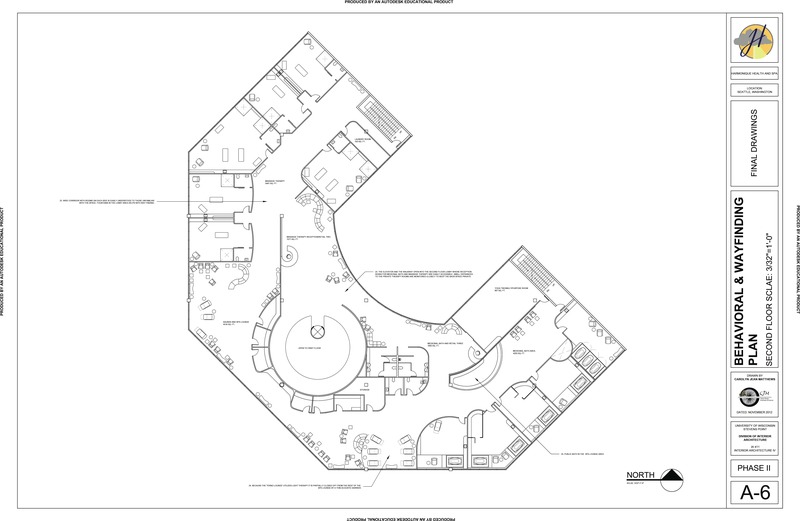 The facility includes therapeutic spa spaces: massage therapy, medicinal bath treatment rooms, and saunas. 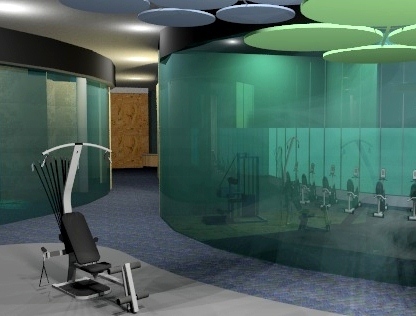 Physical therapy spaces: yoga rooms, exercise rooms, and a small indoor pool. Public spaces: restaurant, café, art gallery, and retail store, as well as an administrative area with offices and a conference room. 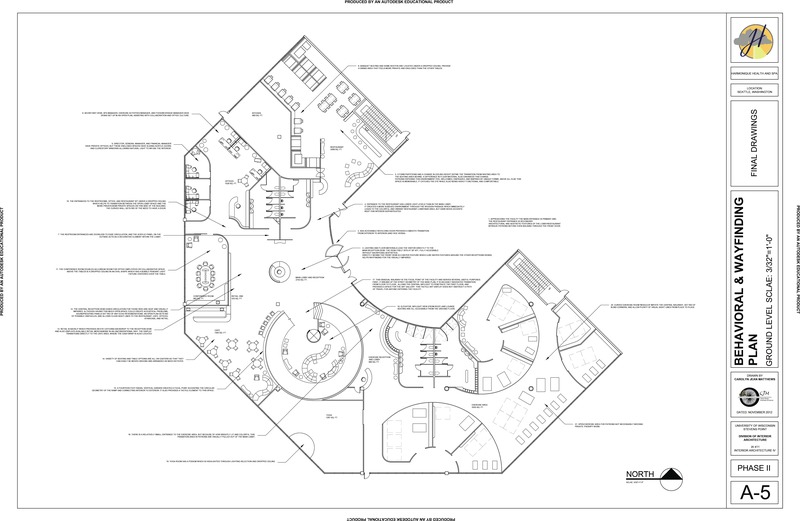 The client is Spirit Health Spas Inc. which is a privately owned company who operate a number or heath and spa facilities. This is their first facility tailored to those with special needs. 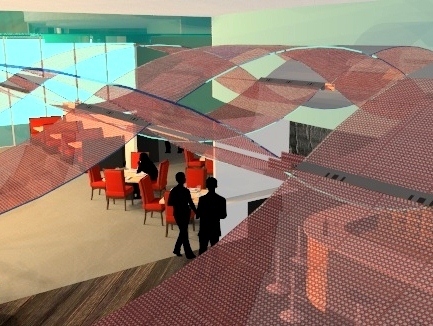 Their primary intention is “To create a facility that will generate unique hospitality services to the visitors as well as the Seattle community with a specific goal in mind: truly inclusive design” they also hope to achieve LEED Platinum certification. This facility is unique because of the specific user group that it accommodates. HARMONIQUE must be specifically designed to include patrons with physical health concerns, visual impairment, and auditory impairment. 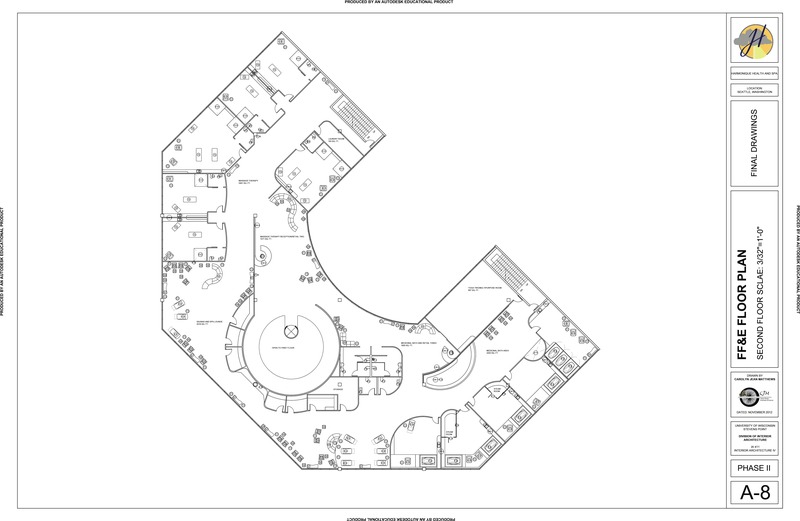 This cutting edge design needs to address concerns such as circulation, accurate way finding, and personal safely as it relates to users with this particular set of limitations. 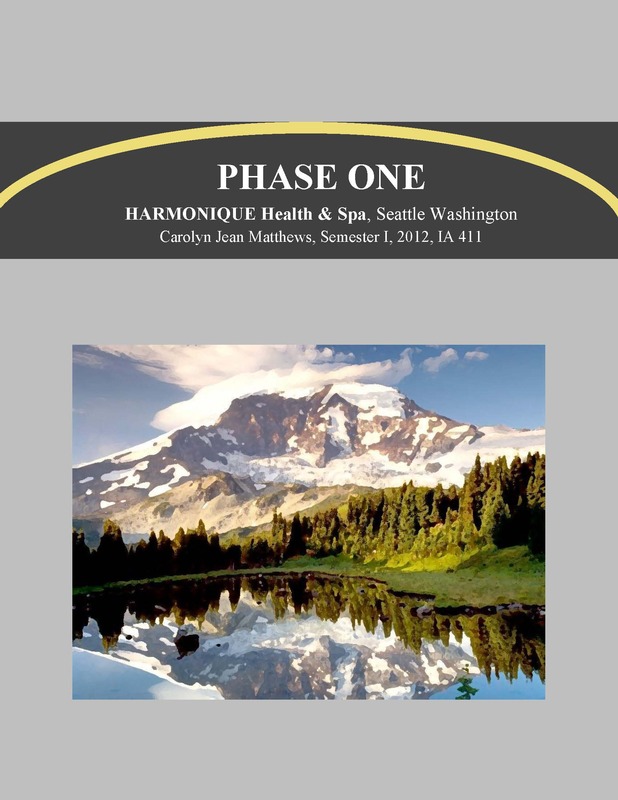 HARMONIQUE Health and Spa is located on the fringes of Seattle Washington on top of Kinnear Park. The structure itself is a new two story post and beam construction that is 40,000 square feet of symmetrical space with lots of glass windows. These windows boast views of the beautiful Puget Sound as well as the Seattle skyline. 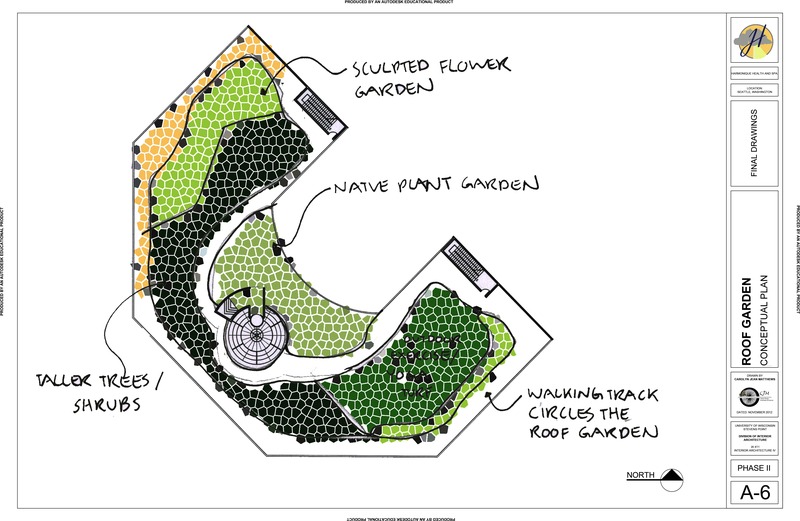 The building design also includes a garden on the roof and a healing garden on ground level. Kinnear Park is a relaxed private setting that is not completely isolated from the Seattle community. 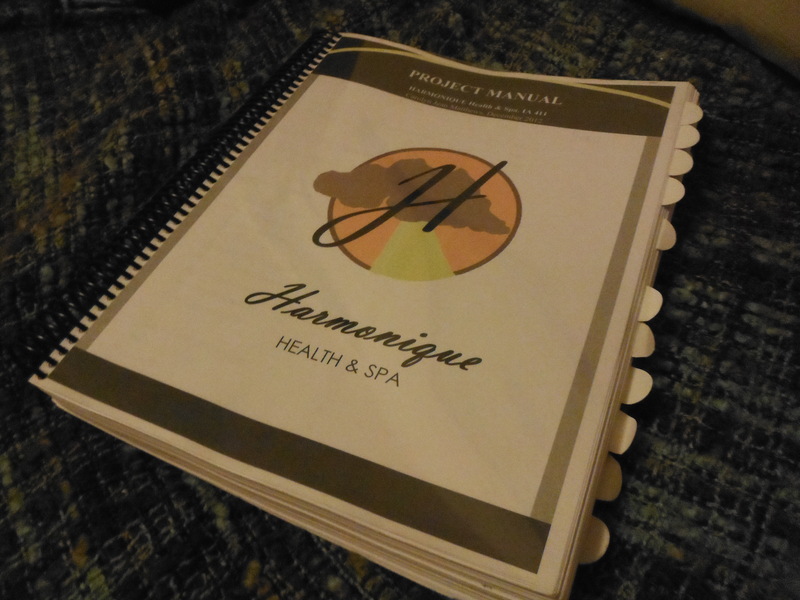 Spirit Health Spas Inc. would like HARMONIQUE Health and Spa to be a unique and forward thinking entity. They would like the design to be contemporary, sleek, organic, fluid, innovative, and to include cutting edge technology and creating problem solving that results in a space that is both functional and beautiful to people from all walks of life. 1) The Design Program: Introduction to the project, client purpose, project requirements, user groups, building and space analysis, and broad design goals. 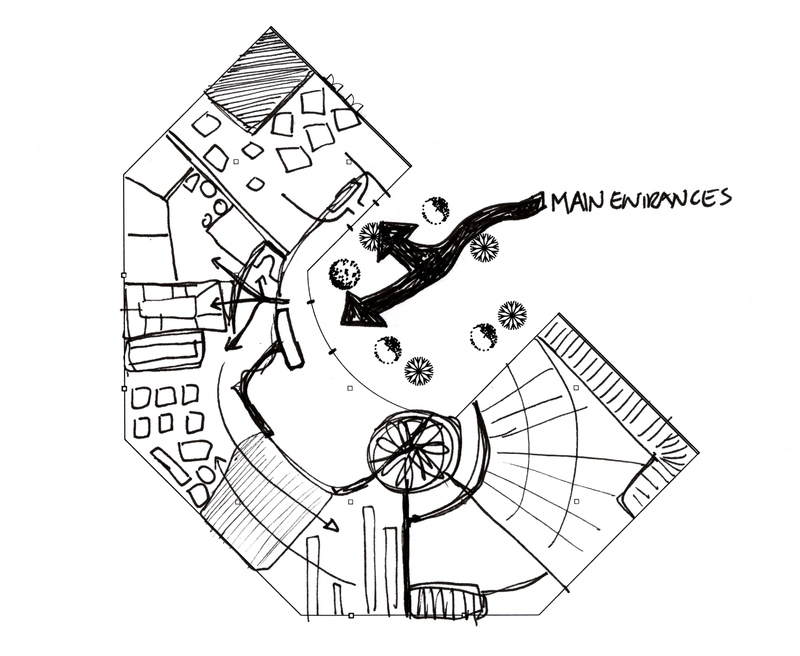 4) Concept Development: Develop a broad design concept for the entire project, state this in sketches and words. 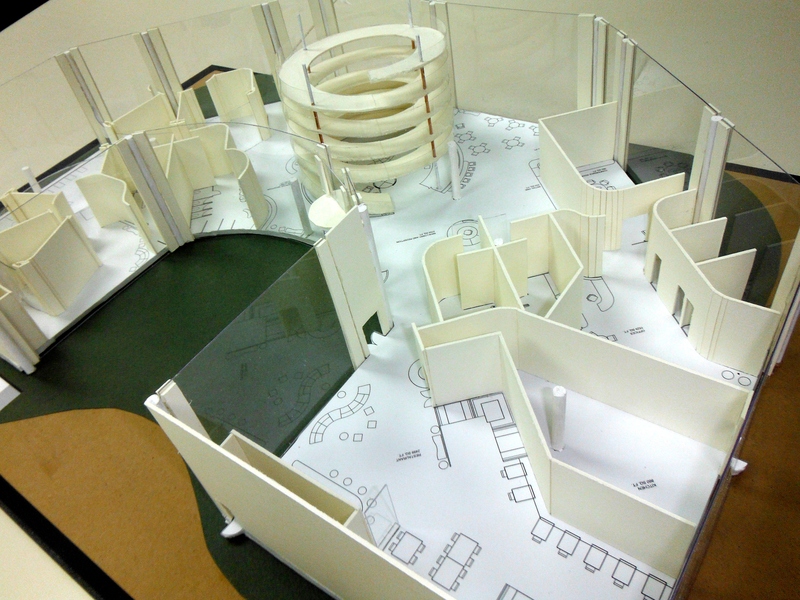 Phase one was completed over the course of 20 days, concluding with a short concept presentation to the studio. The submission was completely digital. On this platform I will be adding the complete submission file as a link, but also will be adding short JPEG galleries of the separate components. The purpose of this post is to show how much work goes into the final presentation, but I’m going to try and keep it easy to navigate and easy to understand! The Space Standards component of this phase is more tailored towards reference, but are still important and now a great resource. PDF file: Space Standards. 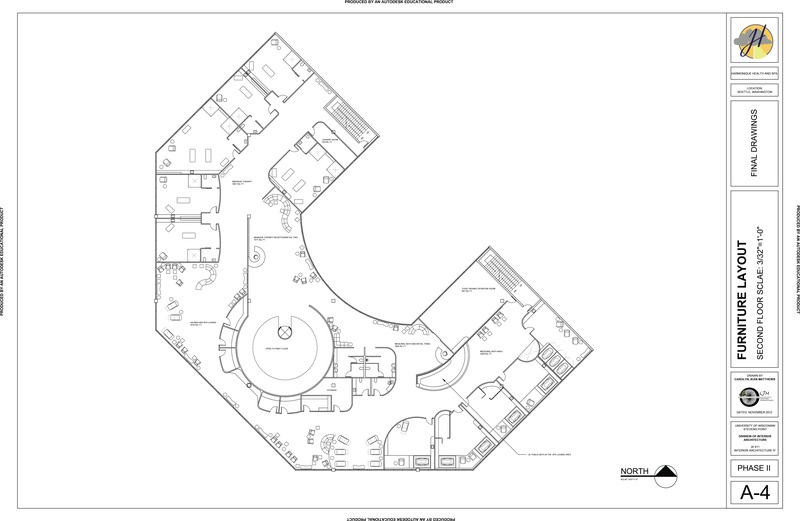 Many of the images in this 56 page document come from “Human Dimension & Interior Space” a book by Julius Panero and Martin Zelink, I also used the “ADA Accessibility Guidelines for Buildings and Facilities” website: http://www.access-board.gov/adaag/html/adaag.htm. 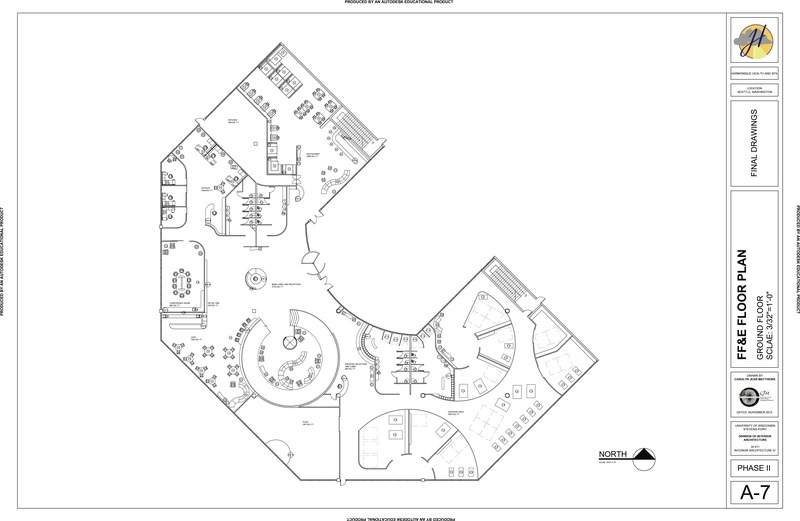 Both are fantastic reference tools for creating up to code ADA accessible facilities. This was the longest and most involved part of Phase Two. 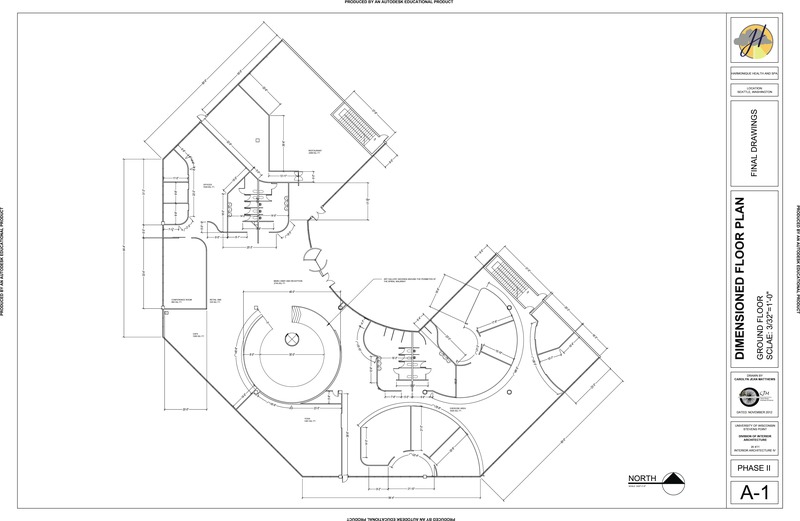 The sheer amount of work that goes into creating a single floor plan is amazing. 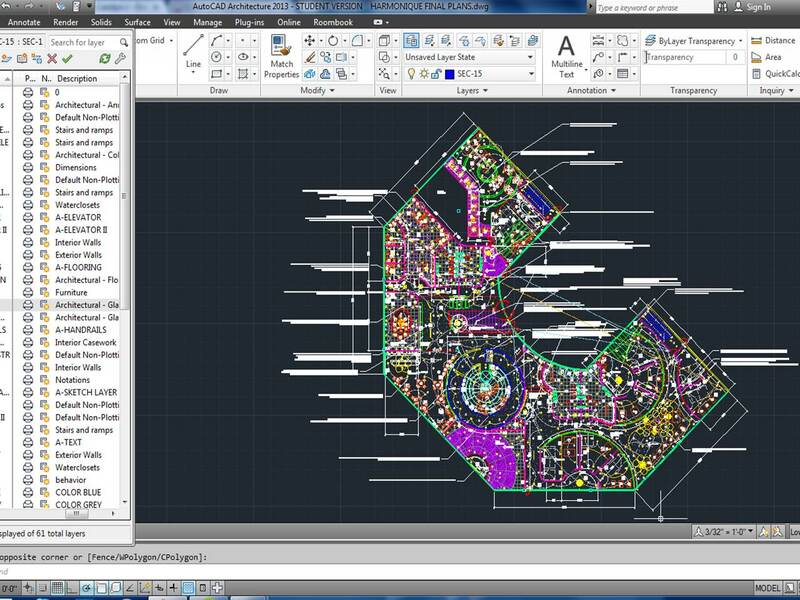 Having to draft six complete plans for this 40,000 sq. ft. two story building was a task to be reckoned with. Go ahead. Try to call me an interior decorator. 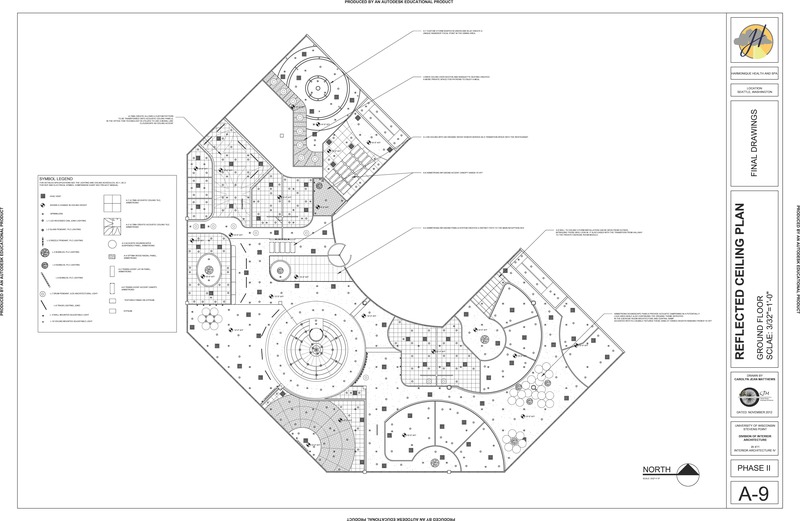 The project manual was an ongoing document required to be complete at the end of Phase Three. 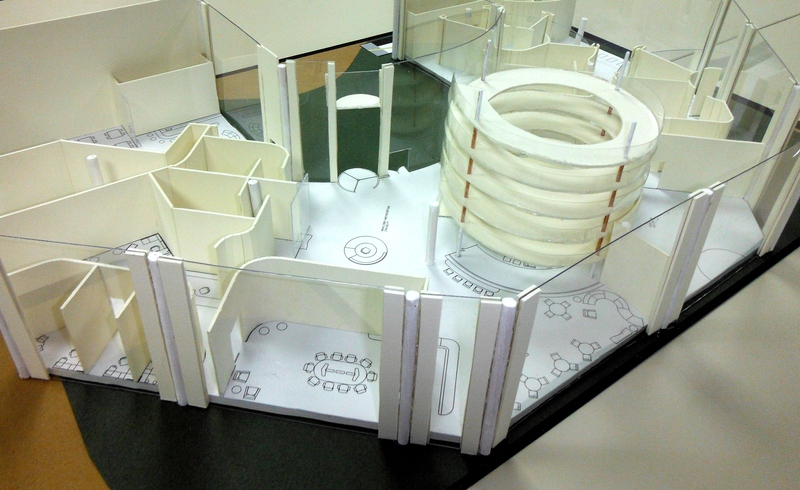 Other than the presentation boards and the 3D model this was the only aspect of the entire project handed in as a hard copy. Here I will include the short version: Fire Safety and Codes, ADA Considerations and Codes, and final Schedules. What I have removed from this forum is the product documentation. The manual itself is more than half documentation. 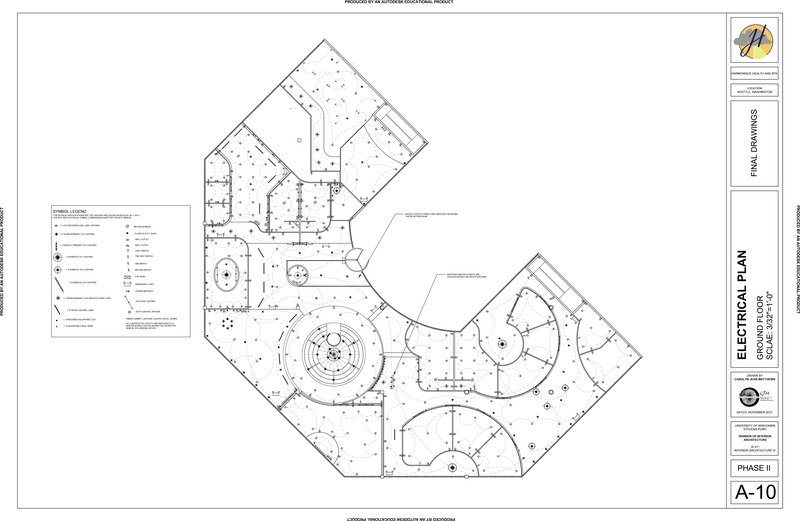 1-5 pages on EACH piece of furniture, each finish, each fixture, and each piece of equipment. Although it looks pretty all bound together and colorful for this platform a schedule will convey the same information. If you have comments or questions about any thing I specified please send me an email! Phase Three was in many ways the most intricate. 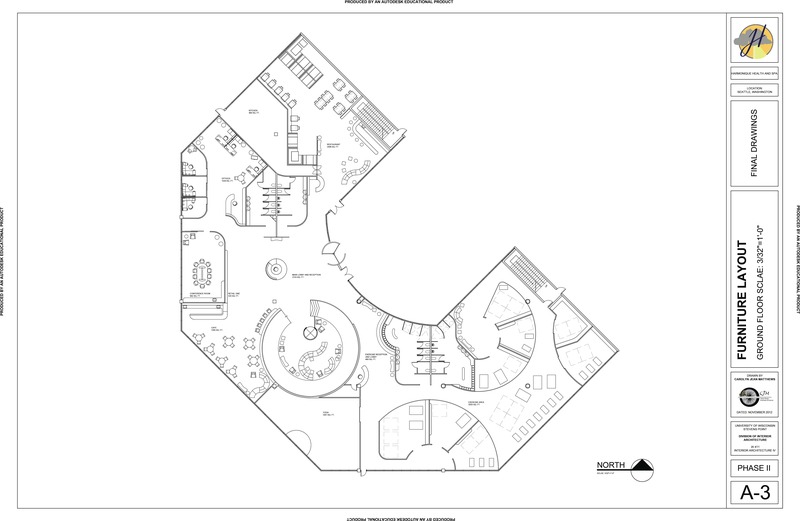 We had around one month to complete two more drafted floor plans, one detail drawing, one elevation, a physical 3D model, presentations boards, and digital renderings. The presentation phase is always exciting to me because this is the part where everything that I can see so clearly in my head comes to life on paper. It is one thing to explain a design to someone, but another thing entirely to present a photo-realistic rendering of your exact design. What we can now do with computers, as well as what we were taught with pencil and marker, will always be magical to me. This is my favorite part of the design process and the part that I usually spend the largest amount of time perfecting. The 3D model is about 2’x2′ and was constructed out of museum board, wood dowels, metal rods, white paint, foam core, various glues, and plastic pirated out of a poster frame. The second floor is left without walls and the first is completely constructed. This was used in my final presentation to help demonstrate broad schematic design elements and way-finding techniques. 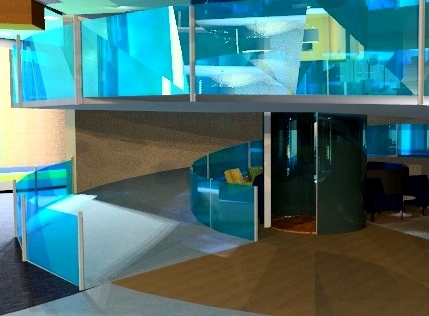 For these renderings I used a combination of Google SketchUP and AutoCAD. 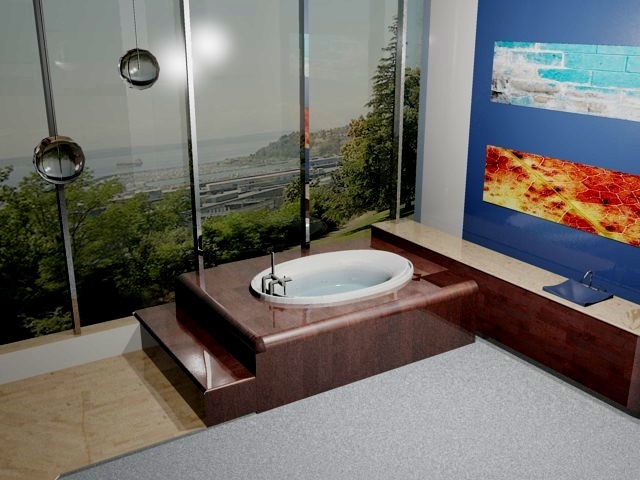 AutoCAD 3D rendering of a medicinal bath treatment room overlooking the Puget Sound. View from the office entrance into the main lobby and reception atrium. 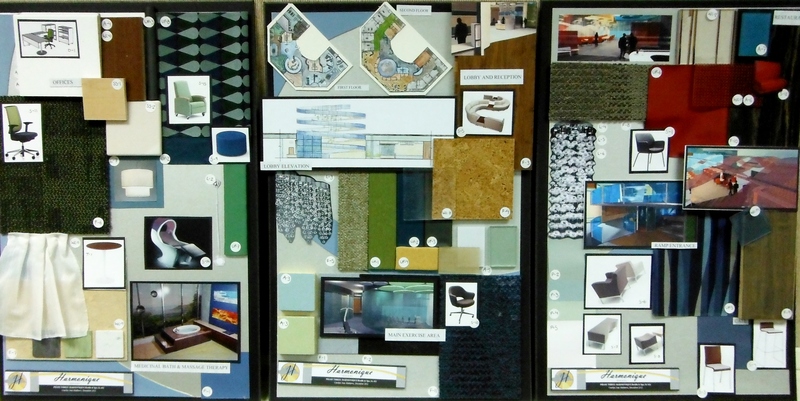 For my presentation I had three large scale material boards. Here they are all next to one another. This section of my Phase Three submission is my pride and joy. This is my favorite aspect of the entire project, and the one that gave me the most trouble! 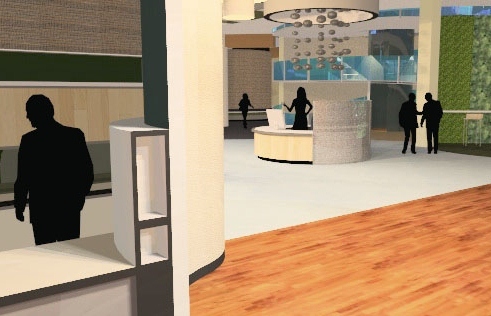 I used Google SketchUp with a little help from AutoCAD to create the 3D model, and a screen shot program called CamStudio to capture the video. I played the animation during my presentation while speaking and pointing out critical parts of the final design. Eventually I am going to add underscoring and voice over to better explain the design to those completely unfamiliar with the project. Until then it is going to remain silent. Because WordPress is not allowing me to embed a video to this post you’ll have to follow a link to YouTube to see the animation…it’s worth it, trust me! This final year of undergraduate studio class taught me many things, some were new and unexpected and others were old and brushed up. This is the first project that I completed start to finish by myself that included all of the parts that a real design project would have. Although the time we were given was brief, and the schedule compressed, this project really gave me an idea of what it would be like if I were a professional designer managing my own firm. And I loved it. I loved every sleepless moment of it and can’t wait for my next opportunity to arise.